Your shower drain is clogged? The first thing you should do is using a plunger to clear a shower drain. Even better: cleaning the shower drain regularly will help to prevent severe blockages of your shower drain. Your shower or bath drain is in particularly frequent use, as many of us take a shower daily. 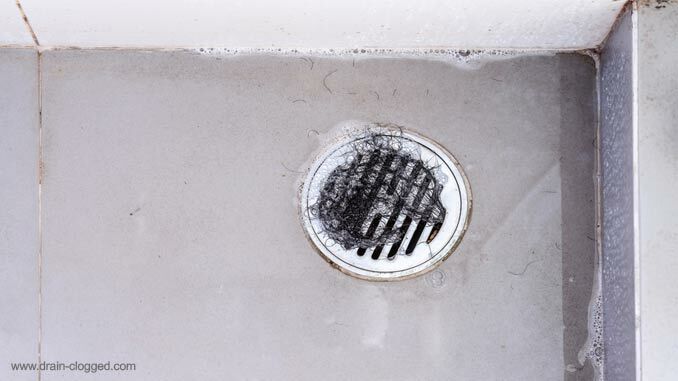 If your hair, soap and other dirt gets caught inside the drain it often times tangles up deep inside the shower drain. Also, crumbs and small stones are being washed down the drain each time we take a shower (find out more about the top tips to clear clogged drains). This is the reason why a shower drain clogs up particularly quickly. Sometimes the drain is gurgling and sometimes the water runs down the drain slowly. Another thing that happens a lot: a smelly drain. Here you will learn how to clear a shower drain! First of all: A clogged shower drain should be cleaned right away to avoid the blockage getting more severe. Hygiene is essential when it comes to having a clean bathroom. If the sanitary equipment, sinks and drains are not cleaned regularly, unpleasant odors or even bugs / insects will be the result. It can get particularly awkward when you are having guests over and the bathroom has not been cleaned in weeks. The most common issues in bathrooms are clogged toilets and clogged drains. Especially a blocked shower drain can be a huge pain. But it doesn’t have to be like that! Once there is hair tangled up inside the pipes, it is unlikely to disappear on its own. Therefore, the best thing to do is to prevent this from happening. Ideally, remove all hair from the shower drain or drain strainer each time you’re done taking a shower. If you find this too disgusting, even if it’s your own hair, just go ahead and put on some rubber gloves. That’s the only way to avoid ending up with a clogged shower drain. It is very helpful to clean a shower drain frequently. When people – students for instance – share a household, they usually set up a cleaning schedule (that is usually not really followed by anyone). 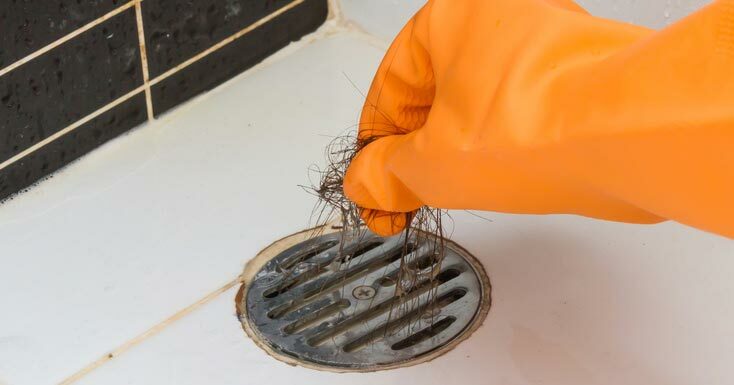 Here, it can happen that a shower drain is not cleaned properly, which results in a clogged shower drain. If you let this happen, it can get quite expensive to clear a shower drain. A great solution for cleaning your shower drain drain, that is both cheap and eco-friendly, is using a plunger. It will help breaking up and removing blockages inside the shower drain without the use of chemicals or a drain cleaner. Please do not unscrew or disassemble the drain or trap of your shower or bathtub by yourself. If you do it incorrectly, this can lead to leaks which will cause water to leak from the drain. This can cause severe damages. Therefore, when your shower drain is blocked to a serious degree, always make sure to consult a professional plumber. He has the right tools and equipment for drains and toilets. Overall there are several possible reasons for a shower drain to clog up. Sometimes it is due to hair , soap or sand being stuck inside the shower drain. This shows that rinsing too much hair, soap or sand / dirt down the shower drain can cause trouble and blockages in the shower.